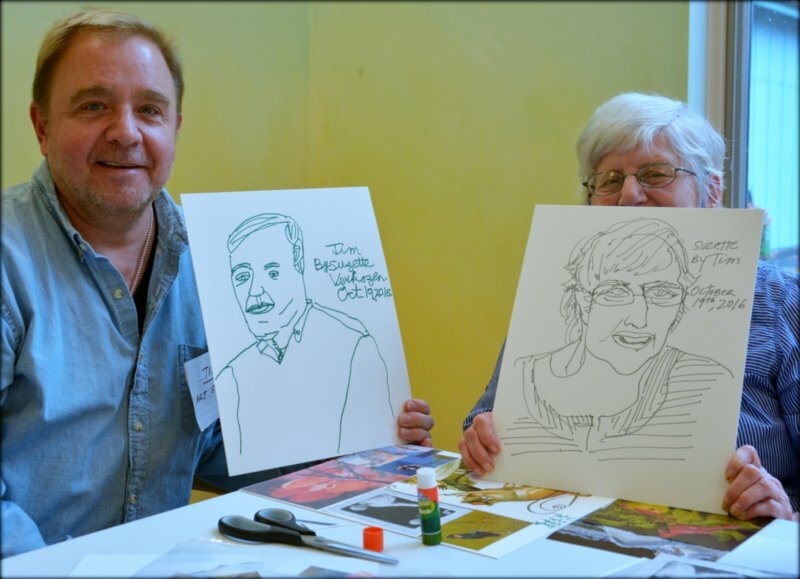 ASCC faculty member Tim Ebneth (left) with reciprocal portraits drawn with Camphill Ghent resident. 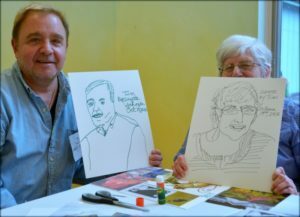 Our “Art & Memories” program uniquely connects seniors in need with the creative renewal of art. In our program “Remembering Special People” seniors learn the medium of collage, and create mixed media pieces combining family images, memories of friends, scraps of letters or sheet music, and events significant in their lives. “Remembering Special Places” teaches seniors how to paint landscapes in acrylic, inspired by places, homes, or locations meaningful to them, including places they have lived or visited. During the creation of this artwork, ASCC’s specially-trained teaching artists and volunteers engage in dialogue about their memories and lives today. We work closely with students to facilitate conversation and engagement. Take-home worksheets with questions and framing the paintings for exhibit help continue the conversation and engagement with visiting friends and family. Be sure to view our web gallery of some of the art created. In addition to the renewing aspect of creating art, ASCC’s “Art & Memories” programs promote community-building over multiple generations and a sense of self-worth and dignity. New programs are planned for 2017, and we welcome partnering with senior and rehabilitation centers. Learn more about our recent free “Art & Memories” programs at Camphill Ghent.